Knopf A FINE FIRST IN DJ. First collected edition, presentation copy, inscribed by the author for his attorney: "Santa Barbara Feb. 1 / 67 / For Harris [Seed], / with profound thanks / for his brilliant and / powerful representation. / Ken." Includes The Moving Target, The Way Some People Die and The Barbarous Coast, NOT PRICE CLIPPED. Signed. FIRST. Book. New York: Alfred A. Knopf, 1967. First edition of this collection. A fine copy in a near fine dust jacket, small closed tear to lower front panel, touch of shelf wear to spine ends, some slight soiling to white backgrounds of jacket. (9968). Octavo, cloth. Signed by the author on the title page. Omnibus volume which reprints three early Lew Archer novels: The Moving Target, The Way Some People Die and The Barbarous Coast. New foreword by the author. Pederson (ed. ), St. James Guide to Crime and Mystery Writers, (4th ed. ), pp. 676-678. 2007-06-05. New. Ships with Tracking Number! INTERNATIONAL WORLDWIDE Shipping available. Buy with confidence, excellent customer service! Alfred a Knopf Inc, 1967. Pale yellow cloth binding, blue/green/gold titles & decoration, blue topstain. Book near fine with slight bleeding of topstain onto pastedowns (very minor), two spots to topstain. DJ also near fine with rubbing, minor soil, light wear to head of spine. Price of $6.95 intact. 528 pp.. First Edition. Hardcover. Very Good/Very Good. Book. New York: Knopf. Fine. 1967. First Omnibus Edition.. Fine in price-clipped dust jacket. Contains THE MOVING TARGET, THE WAY SOME PEOPLE DIE, and THE BARBAROUS COAST. .
New York: Alfred A. Knopf, 1967. 1st . Hardcover. Very good/very good. 1st collected edition. Cloth. Dust jacket. Very good condition. NY: Alfred A. Knopf. F. 1967. 1st Edition. Hardcover. Stated first edition bound in beige cloth with blue lettering and desi gns 8vo size, 527pp. A Fine copy in a Fine dust jacket. Collects three Lew Archer novels: "The Moving Target", "The Way Some People Die", a nd "The Barbarous Coast". .
Alfred a Knopf. Hardcover. 9997402529 New Condition. . New. 2007-06-05. Good. Ships with Tracking Number! INTERNATIONAL WORLDWIDE Shipping available. May not contain Access Codes or Supplements. May be ex-library. Shipping & Handling by region. Buy with confidence, excellent customer service! NY: Knopf. Hardcover. First edition. 528 pp. Full bound with tan cloth covered boards. Modestly shaken with slight darkening along the edges of the boards, moderately soiled page ends, moderately softened spine ends and a stamped"H" with a circle around it on the ffep. DJ in mylar cover has edge and corner wear with several small chips and closed tears, moderate rubbing, and a flaw in the laminate on the leading edge of the front panel. Thus, VG/VG. Fine (F) is our highest grade. 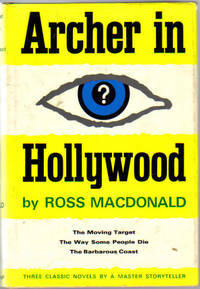 Omnibus edition containing the novels "The Moving Target", The Way Some People Die", and The Barbarous Coast". (14373.3) . Very Good. 1967. 1st Edition. Alfred a Knopf, 1967. Book Club Edition. Hardcover. Very Good. Disclaimer:A copy that has been read, but remains in excellent condition. Pages are intact and are not marred by notes or highlighting, but may contain a neat previous owner name. The spine remains undamaged. At ThriftBooks, our motto is: Read More, Spend Less.Dust jacket in good condition. Book club edition. Minor shelf and handling wear, overall a clean solid copy with minimal signs of use. Boards betray fading and nicks and other signs of wear and imperfection commensurate with age. Binding is structurally sound. Penciled prices on front endpaper, all interior pages absent any extraneous marks. Gutter code: 30I. New mylar added to ensure future enjoyment. Secure packaging for safe delivery.Dust jacket quality is not guaranteed. Knopf. Hardcover. B0006BQ8LS Meets the good condition guidelines. Has some staining. Has wear. Five star seller - Buy with confidence! . Good. New York: Alfred A. Knopf, 1967. The Moving Target, The Way Some People Die, The Barbarous Coast in one book. Small initial on ffep. Smudges, stain, 1' tear plus other smaller, top 1/8" spine missing on dust jacket.. Book Club (BCE/BOMC). Hard Cover. Very Good/Good. Alfred A. Knopf, New York. Hardcover. Book club. Good in torn chipped few ink marks on front panel dust jacket. * Combined publication of: The Moving Target, The Way Some People Die, and The Barbarous Coast. books carefully packed and shipped promptly . Good. 1967. Very Good. VG++ book/good jacket. Book club edition. New York: Alfed A. Knopf, 1967. 528pp. Teale cloth hardcover with black spine title, book corners rubbed. Dustjacket is soiled and rubbed with chipping at the corners and a 1 1/2 inch tear at the foot of the jacket spine with some minor losses.. Book Club (BCE/BOMC). Hardcover. Very Good/Fair. 8vo - over 7¾" - 9¾" Tall. Fawcett Crest, 1977. First Printing. Near Fine condition. Ink mark to the cover. Movie Tie-in. Alfred A. Knopf. Used - Good. Good condition. Acceptable dust jacket. Book Club edition. Alfred a Knopf, 1967. Hardcover. Good. Disclaimer:A copy that has been read, but remains in clean condition. All pages are intact, and the cover is intact. The spine may show signs of wear. Pages can include limited notes and highlighting, and the copy can include previous owner inscriptions. The dust jacket is missing. At ThriftBooks, our motto is: Read More, Spend Less.